Can't access forum -IP Ban ? I've just got a new phone and have been adding all my favourite websites to the browser. 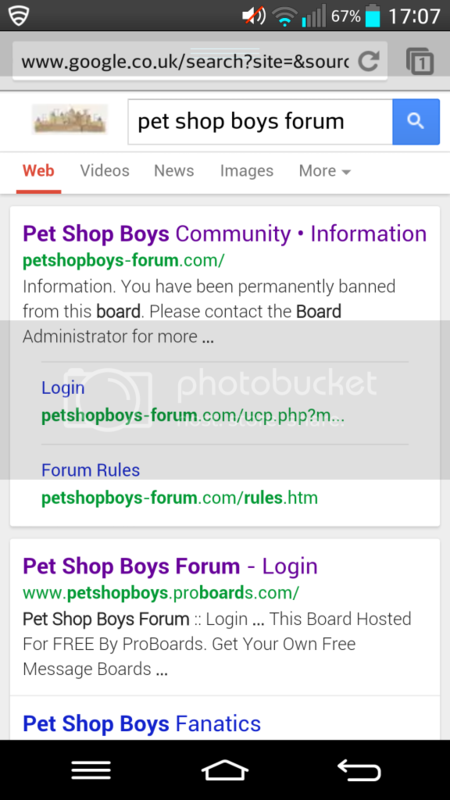 I searched for this forum via google and Bing but the only results I get is a link to the site saying banned by ip and I can't log in. I also get the same result if I manually type the address in. I'm guessing that the "search engine bots" have been manually banned perhaps ? This only happens with the Google Chrome browser and not the native Android one which I can log in with. I can also login with my PC. Is this down to the forum software getting confused between loading up the phone/tablet style forum and the desktop version ? Re: Can't access forum -IP Ban ? Please can you send me a PM with your current IP - I will check, why it's banned and set it free again! I'm pretty sure it's something to do with the Chrome browser and the search result it gets when looking for this forum rather than any IP for myself. The ban message is the default result when searching. Here's a screenshot of what comes up. I can access the forum no problem via my PC or the default Android browser and they are all using the same IP address, so I think the problem is something different. If you click on the link that the search brings up you're presented with the message "your IP is permanently banned etc .." and you can't log in. However, if you use the native browser to search for the forum you just get the normal result and you can log in. I'm guessing that maybe the forum software may have blocked the Google Chrome searchbot and somehow if you try to enter the forum via this entry the user gets tarred with this too ? Can I ask any other Android users who read this to do a search for the forum using Chrome and see what they get? Cheers! strange, the German results seem to work fine! Can't do anything to fix that! If the Google.UK (.COM) robot is banned, it should be a temporary ban and we have to see, what happens after the next check (in a few weeks).